After many years of travel, your mind has wonderful images of beautiful places that you have visited. I have been lucky to have traveled to many scenic spots around the globe. From Alaska to New Zealand to Switzerland and Germany's Bavaria, I have enjoyed many postcard perfect scenes. Beyond that I lived on the shore in Nova Scotia and more recently on the side of a mountain in Virginia. From our Nova Scotia home I used to watch the sun set over the Bay of Fundy. From our Virginia home, I could roll out of bed and capture the sun as it climbed above the mountains surrounding downtown Roanoke. All of those places have left me with wonderful memories, vivid images, and thousands of pictures. As wonderful as all those places are, my mind ends up being a blank slate when I get out on the water here along North Carolina's Southern Outer Banks. It is nearly impossible to describe the beauty of this area in words. Only photography offers the chance to share some of the beauty with people who are unable to actually make a boat trip. I often talk about the wonders of living along the water. Here along the Crystal Coast a water view is highly prized. Yet as wonderful as it to live by the water, the appreciation of the water and the beauty of the surrounding land deepens greatly when you are actually out on the water. Something truly special happens when you make a turn, and you see nothing but sky, water, and amazing marshes filling the horizon. It is almost like the scenery just washes over my mind's eye and clears out any old images. Understanding that you can be swallowed up by the beautiful scenery around you explains one of the great mysteries of being out on the water. Often we go out and find a spot to fish and enjoy the beauty around us only to discover that time has little relevance for us. What we thought was an hour, possibly was actually three or four hours. If we are lucky enough to have escaped any cell phone calls, then it is very easy to suffer time dis-orientation. We have no idea what time is, and sometimes we end up forgetting even when we left. Fortunately hunger usually shakes us back to reality, but it is truly amazing how our area's scenic beauty can lull you almost into another dimension. What is even more fun is that the images from the water stick with you. I can easily remember many wonderful water trips while I have a hard time recalling any of my road trips even though I have driven around the United States three times. It is almost like the best images from my water adventures are burned into my brain. I can flip through almost at will. Time hardly seems to dim them. I remember the water on a trip that I called Mackerel Morning almost as clearly as it was two weeks ago instead of over two years ago. As good as the pictures might be, there are times when you can only appreciate the true beauty of the moment by being there. The wind on your face, the smells of ocean water, and the warmth of the sun all contribute to special moments. While our minds can record those feelings, it is the rare photograph that can do justice to one of those special moments. Even this evening, I spent a long time deciding what picture could best capture a sampling of the beauty of this area. I came close to picking a special ocean wave or perhaps a view of Bogue Sound from the Emerald Isle Bridge, but in the end I went with this recent shot taken as we turned towards Bear Island from the Intracoastal Waterway. It highlights the expansiveness that often captures our eyes and imagination. The clouds, the water, and the marshes are all part of the equation that ends up equaling scenic beauty that pulls many of us to choose the Crystal Coast as our permanent homes. We are the really lucky ones. We wake up to the beauty of this area every day. It is literally on our doorsteps. I know that I am not the only resident who can lose himself by enjoying just a few hours on the water. The good news is that many of those wonderful views that have so enchanted me are very accessible by boat. 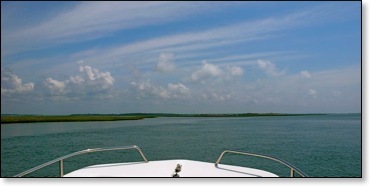 Some can even be seen while riding the pontoon ferry over to Hammocks Beach State Park. We live in area where kayaking and boating are a big part of life so it is not very hard to find a boat ride in Carteret County. Now is a great time to visit, and there are some special deals for those people booking vacations now. If you too become smitten with the area and need more permanent accommodations, we have folks who can also find a cure for that. Some join us and allow our waters to paint some new memories for you and your family.